Book alert, book alert! Remember The Groom’s Instruction Manual I told you about, Mother of the Bride, in my Building a Bridge to the Groom post? Good news—there is also an instruction manual for the bride! 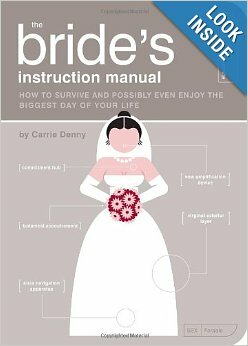 The Bride’s Instruction Manual by Carrie Denny looks every bit as cute, fun, and helpful as its counterpart for the grooms. I’ve only seen it online myself, but 95 reviews had been posted on Amazon when I last checked and it averaged 4.4 out of 5 stars. Looks like a winner, doesn’t it? If my girls were still brides-to-be, I bet I’d be buying them copies of this book. Sounds like it would give them help plus make them laugh at the same time. Definitely a winning combination! So take a look, MOB. You might decide your sweet girl needs this book! *You might also like to read Building a Bridge to the Groom and Gift Idea: The Newlywed’s Instruction Manual. *Hope this updated post from Oct. 2013 is helpful to you today, MOB! As believers in Christ, we face spiritual battles daily—attacks from the same enemy who enticed and deceived Adam and Eve in the Garden of Eden (Genesis 3). Some refer to him as the devil, others call him by name—Satan. Satan is a formidable enemy and comes at us in a multitude of ways, sometimes as a roaring lion (1 Peter 5:8) and other times masquerading as an angel of light (2 Corinthians 11:14). And he is not alone. He leads an army of evil forces (Ephesians 6:12). Scripture tells us we need to put on the full armor of God to do battle against this enemy of our souls (Ephesians 6:11, 13). With the armor of God firmly in place and with God’s help, we can withstand Satan’s onslaught and gain victory over him and his spiritual forces of evil. Sometimes victory is simply standing. As weak as we may feel when we pull ourselves to our feet one more time, we are indeed victorious as we stand and refuse to let Satan keep us down. Are you struggling to get to your feet spiritually today? Take hold of God’s hand. He will help you stand. *What have you found helps you the most when you’re in the midst of a spiritual battle? 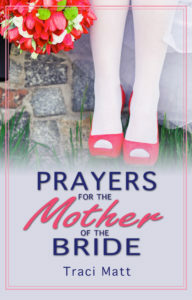 Mother of the Bride, if you are a Christian mom who would like to prayerfully prepare for your daughter’s wedding and her new status as a married woman, be sure to read author Traci Matt’s new book Prayers for the Mother of the Bride. You may remember hearing about Traci Matt here on my blog once before. 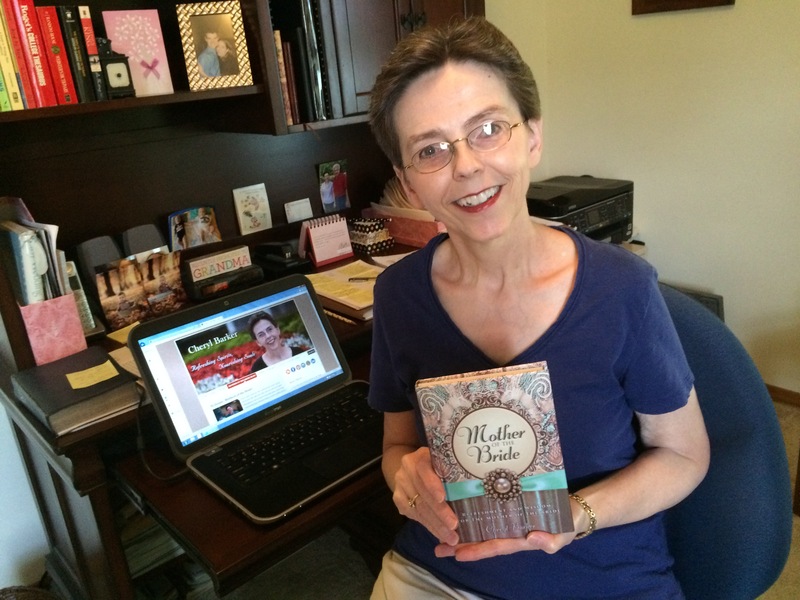 Earlier this year I reviewed her book Prayers for the Mother of the Groom. 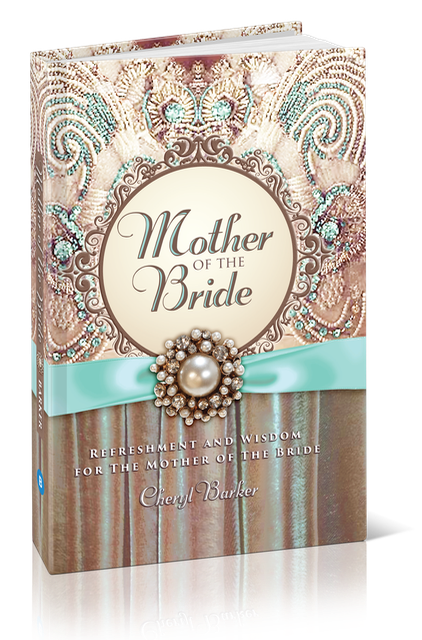 Isn’t it wonderful that mothers of the bride can now be blessed by a similar prayer resource! 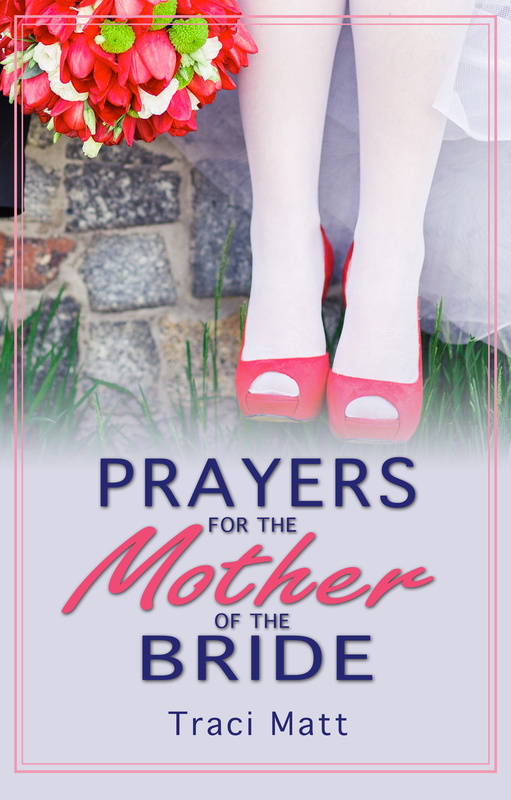 Prayers for the Mother of the Bride is a wonderfully thorough and insightful prayer handbook for Christian moms who want to cover their daughters, themselves, their families, and the entire bridal party in prayer as they all go through the life-changing event of a wedding. Like Matt’s book for mothers of the groom, this book is designed in a two-month countdown fashion. 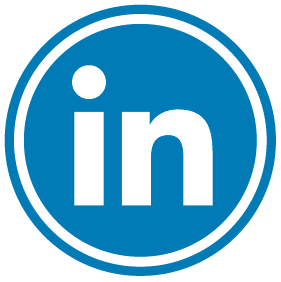 She points out in the introduction that readers can start using it at any time during the engagement and possibly go through it more than once. Mother of the Bride, I would definitely advise you to begin using it much earlier than the two-month mark. 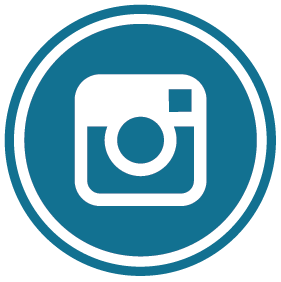 Many of the topics covered are applicable in the early stages of wedding planning so you don’t want to miss the blessing of considering those topics and praying about them at the appropriate time. Also as in Matt’s earlier book, each of the sixty selections feature an introductory paragraph or two about some aspect of the wedding or the changing family dynamic and then includes an in-depth prayer addressing the topic of the day. Matt’s prayers spring from the truths and insights she’s gleaned from the Word of God and from her own personal experience as both a mother of the bride and a mother of the groom. After each selection she adds “Something Borrowed”—a quote applicable to that day’s topic. In this nicely done self-published paperback book, you will discover a biblically based, heartfelt guide for you own prayers, MOB. 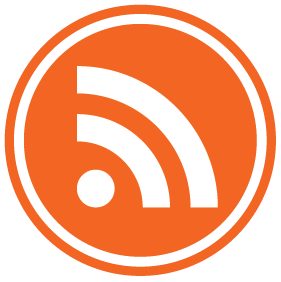 As a writer, I might have done a few things differently where organization and approach are concerned, but Matt is a skillful writer with godly insight and an easy-to-read writing style. 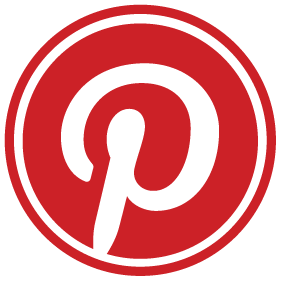 I’m sure you will enjoy using this resource and be blessed immensely by it. So MOB, if Prayers for the Mother of the Bride sounds like something you would be interested in, I encourage you to treat yourself to a copy of it today. It will be well worth the investment! 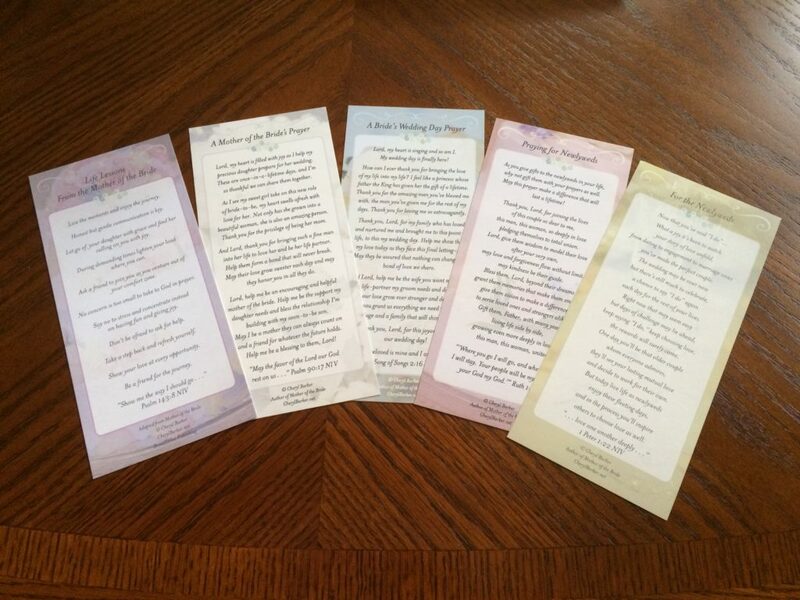 *You might also like to read Gift Idea: Prayers for the Mother of the Groom and A Prayer for the Newlyweds. *Thanks to the author for providing me with the book and photo. The opinions expressed are my own. 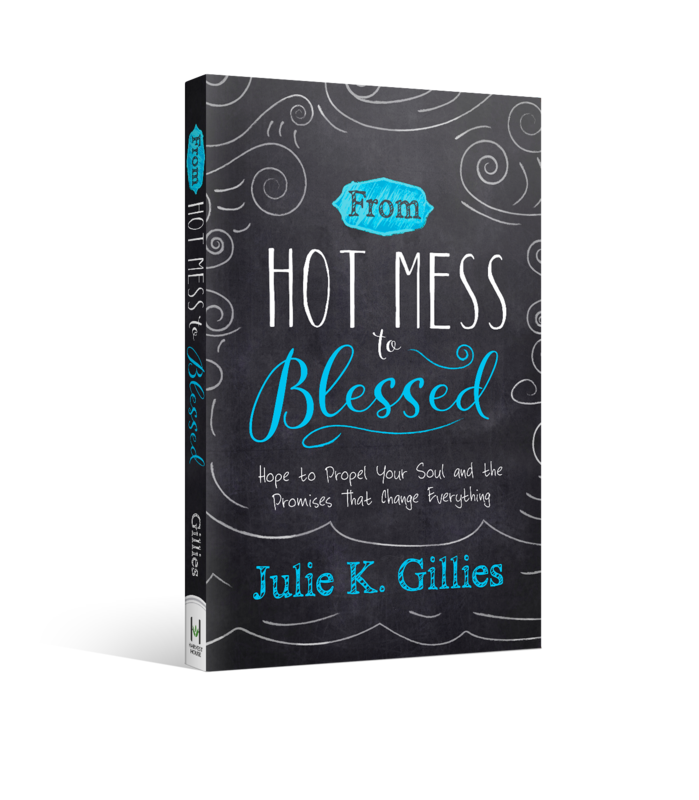 I’d like to welcome writer friend and author Julie Gillies to my blog today as she shares an excerpt adapted from her recently released book From Hot Mess to Blessed. I’ve already read the book and it’s filled with biblical wisdom, encouragement, and hope. I pray Julie’s words bless you today! Bravery has ripple effects. We rarely consider this (at least I don’t) because we’re so caught up in the everyday and the here and now. 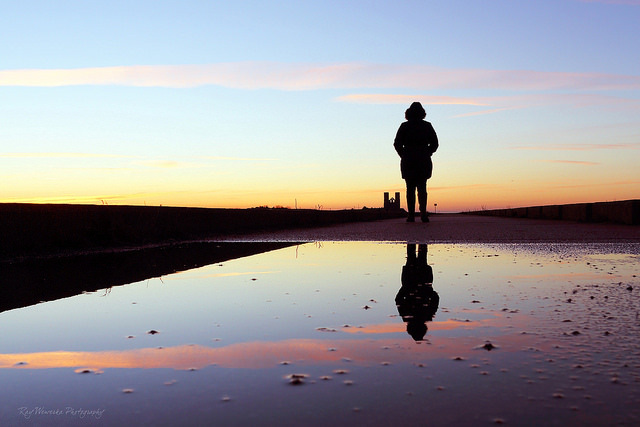 Life’s daily battles are intense, and sometimes it’s all we can do to remain focused and keep plowing forward. Yet our courageous choices act as a gleaming machete, slicing a path through the thick jungle of fear that entangles and trips. Choosing brave helps us fully believe and embrace and pursue God’s promises while inspiring those around us and making a way for those behind us. A key component in learning to embrace bravery is praying brave prayers—prayers that focus less on avoiding fear or keeping fear away from us and more on courage and confidence and holy mettle. Though we might not always feel fearless, by praying for specific qualities from Scripture, we can fear less. – Instead of praying that fear will be far from us, we can pray for strong, bold, and very courageous hearts (see Joshua 1:9) when fear comes near. – Instead of asking God to remove all the sources of fear in our lives, we can pray for His grace to run toward the big, scary things with great courage (see 1 Samuel 17:48). – Instead of praying that fear will leave us alone, we can pray that when we are afraid, we will have confidence and put our reliance on God (see Psalm 56:3). – Instead of asking God for all fear in our lives to vanish, we can pray that His peace that surpasses all understanding will guard our hearts and minds in Christ Jesus—and supersede all fear (see Philippians 4:6-7). – Instead of feeling alone and fearful, we can pray to consistently remember God is with us, and we don’t have to fear. King David declared, “The Lᴏʀᴅ is for me, so I will have no fear” (Psalm 118:6 ɴʟᴛ). I think I need to write the above verse on a Sticky Note and attach it to my forehead. If I had it my way, I’d never wrestle with fear again. It would be completely and permanently eradicated from my life (Can I get an amen?). But this side of eternity, I don’t know how realistic that goal is. I think we will all have times when we must battle fear, but it is always for a purpose. Facing down fear teaches us how to engage the enemy, to fight, to stand, and to prevail. So be beautifully clothed in His mighty strength and the holy dignity He lavishly provides. Laugh without a care, free from fear’s taunts and digs. I see us—hot messes though we may yet be—laughing beautiful, musical laughs, heads tossed back, and hearts lifted toward heaven because we have nothing to fear. This is an adapted excerpt from the book, “From Hot Mess to Blessed: Hope to Propel Your Soul and the Promises that Change Everything”, Harvest House Publishers 2017. Used with permission. 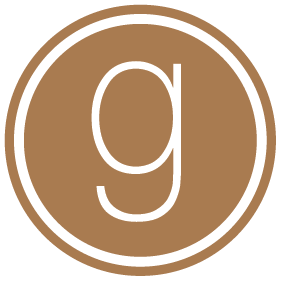 *Question from Cheryl: What situation in your life is God calling you to choose brave for today? 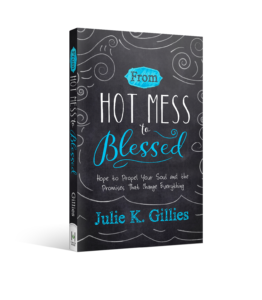 Julie K. Gillies is the author of From Hot Mess to Blessed: Hope to Propel Your Soul and the Promises that Change Everything and the devotional, Prayers for a Woman’s Soul. 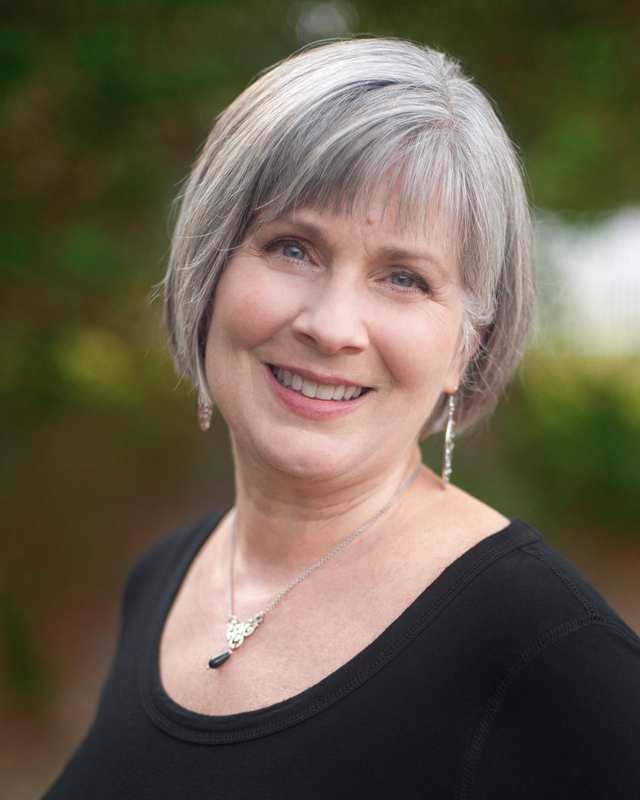 Healed from a traumatic childhood, Julie’s message helps women pray, know, and believe God’s Word. Julie is the joyful wife of Keith, mom of two soldiers and one civilian, and Grammy of four. She loves bicycling , any day without humidity, and hanging out with the entire family at home, especially on days when her house is clean. 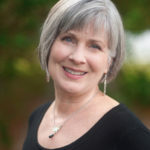 Find FREE resources and connect with Julie at www.JulieGillies.com .